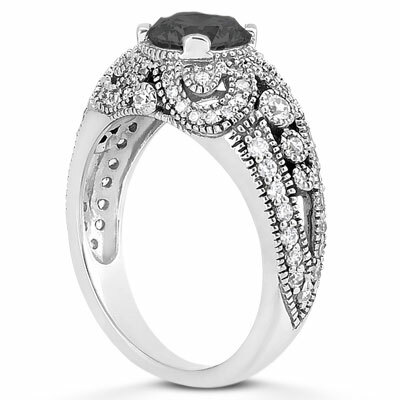 There are no gray areas when it comes to the sophistication of this stunning 0.89 carat black and white diamond vintage style engagement ring in 14K white gold. 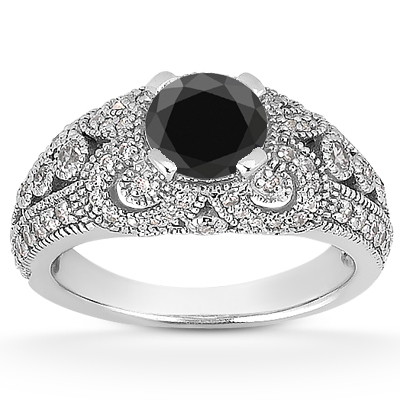 A half carat round black diamond serves as the center stone of this glamorous piece and provides a hint of mystery. Over 60 smaller white diamonds sparkle in striking contrast to this center gem as they mingle with elegant beaded edges to form a 14k white gold style that celebrates the beauty of the past. 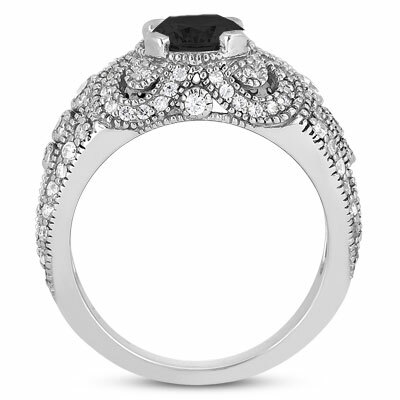 A jet black 0.50 carat diamond is surrounded by 0.39 carats of white diamonds in this vintage style engagement ring made in 14K white gold for a total of 0.89 carats of diamonds. Also available in 14K Rose Gold, 14K Yellow Gold or Platinum and 1 Carat Center by request. We guarantee our 0.89 Carat Black and White Diamond Vintage Style Engagement Ring to be high quality, authentic jewelry, as described above.